DEAR MAYO CLINIC: What is postural tachycardia syndrome, and how is it diagnosed? Can it be treated, or do you just have to live with it? ANSWER: A diagnosis of postural tachycardia syndrome, commonly known as POTS, typically is based on symptoms, along with the results of an assessment called a tilt table test. Although there’s no cure for postural tachycardia syndrome, often it can be managed effectively with lifestyle changes and medication. And fortunately, teenagers — the group most often affected by POTS — usually outgrow the disorder by the time they reach their 20s. Postural tachycardia syndrome affects the autonomic nervous system, which controls involuntary body functions such as heart rate and blood pressure. In postural tachycardia syndrome, the nerves that regulate blood flow are out of balance, so enough blood doesn’t go to the right place at the right time. The result is a variety of symptoms, including an overly rapid heartbeat when shifting from lying down to standing up. A person’s heart rate is usually about 70 to 80 beats per minute when resting. Normally, the heart rate increases by 10 to 15 beats per minute when standing up, and then it settles down again. For people with postural tachycardia syndrome, the heart rate goes up considerably higher when they stand, often increasing 30 to 50 beats per minute or more. This can lead to lightheadedness, dizziness and fainting. Other postural tachycardia syndrome symptoms may include chronic fatigue; headaches or other types of chronic pain; and digestive problems, such as nausea and cramping. These symptoms may vary considerably from one person to another. If symptoms seem to be pointing to postural tachycardia syndrome, the diagnosis usually is confirmed using a tilt table test. 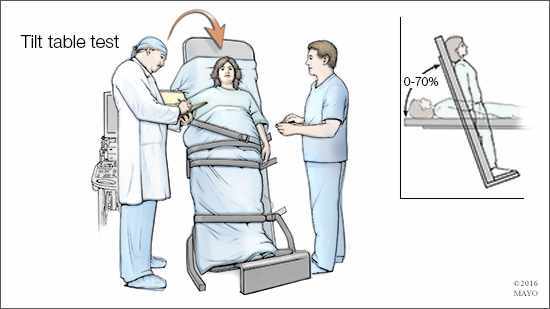 For a tilt table test, you begin by lying flat on a table. Straps are put around your body to hold you in place. After about 30 minutes of lying flat, the table is quickly tilted to raise your body to a head-up position — simulating a change in position from lying down to standing up. Then, your heart rate and blood pressure are monitored for about 10 minutes. In people who have postural tachycardia syndrome, the heart rate goes up by more than 30 beats per minute when tilted up (40 beats per minute or more for teenagers). Blood pressure remains steady or changes only slightly. Postural tachycardia syndrome begins in the teenage or early adulthood years. Although postural tachycardia syndrome is a chronic condition, about 80 percent of patients grow out of it. Until that happens, treatment can ease postural tachycardia syndrome symptoms. In people who have postural tachycardia syndrome, the blood vessels are too relaxed. Extra fluid is needed to fill up the vessels, allowing blood to flow properly. Drinking extra fluids alone isn’t enough. Increased salt intake is also necessary to hold fluid in the blood vessels. It’s also important for people with postural tachycardia syndrome to avoid caffeine and alcohol. Exercise is critical. Engaging in daily, moderate, aerobic exercise — biking, rowing or swimming, for example — not only improves fitness and increases energy levels, but also works to retrain the autonomic nervous system to regulate blood flow correctly. Wearing garments that mildly compress the thighs and abdomen also can encourage proper blood flow and reduce postural tachycardia syndrome symptoms. A variety of medications are available to treat postural tachycardia syndrome. But they are generally not effective if the strategies of fluid, salt, compression and exercise are not also in place.